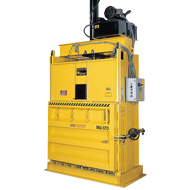 The M-60 STD is a high density baler with an extra heavy duty frame. It is the toughest and most reliable 60 inch vertical mill-sized downstroke baler you can buy. It makes mill-size bales of corrugated cardboard weighing up to 1,100 pounds, stretch wrap and shrink wrap bales up to 1,200 pounds and clothing bales up to 800 pounds. Increase the efficiency of your waste disposal operations and, boost your bottom line. 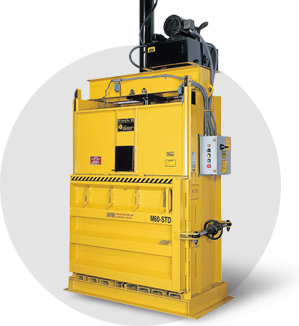 The M-60 STD Vertical Baler is a powerful yet economical workhorse that gives you the flexibility to bale a variety of materials with ease. A fast 47-second cycle time handles large jobs in short order. With a footprint of 44" x 80" and just 148" high, it maximizes the efficiency of your recycling program with a minimum amount of floor space. Loaded with features and designed with quality components for long life in the harshest environments, it sets the standard for performance that others try to follow. Best of all, it's designed for safe, one-person operation. Reduce waste disposal costs and save money. The M-60 STD makes it easy! Locally: 763-509-7916 ask for Fred Simmons at Ext. 216. ©2019 Ver-tech, Inc. All Rights Reserved. | Artbox Creative Studios another Minneapolis Web Design.